The Arrotino (knife sharpener), also known as the Scythian, is a marble statue of the first century BC. It is the Roman copy of a Hellenistic statue. However, because of the beauty and the wonderful workmanship of the statue for a long time it was believed that it was an original greek sculpture. It was also considered one of the finest surviving classical works. The work was found in Rome, during the 16th century: Cardinal Ferdinando de\' Medici bought it in 1561. 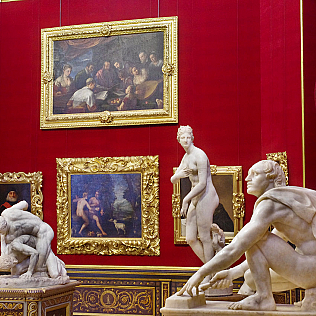 In the 18th century it was in Florence: the statue is represented in the painting The Tribuna of the Uffizi by Johann Zoffany, painted between 1772 and 1778. The Arrotino was part of a group, along with other lost sculptures, representing Apollo flaying Marsyas. What does the myth tell? Marsyas was a satyr and was very good at playing the flute. His talent was known to all. Someone started to say that Marsyas was better than Apollo, god of music. The versions of the myth are different, but all of them end with the victory of Apollo and the terrible punishment endured by Marsia: being flayed alive. In the past, the man sharpening a knife on a stone had been recognized as a Scythian, and as a royal barber who overhears and is planning a conspiracy against the state.